Apple, Rolex and Monocle love their exclusive appeal, but to what end? While scores of marketers practically bear-hugged Facebook and Twitter when they first launched, seeing these social platforms as an opportunity to reach the masses, luxury brands stayed mostly out of sight, preferring to remain niche and elite. But as social becomes a key component in marketing, some luxury brands are beginning to play catch up. Chanel, Burberry and Louis Vuitton have come to see the value of social media. Chanel, which has been on Twitter since 2011, only recently began posting photos to its Instagram account—good news for the 1.7 million followers who had waited for months to interact with the fashion brand. Meanwhile, Burberry is now dedicating 60 percent of its budget to digital thanks to social successes, while Luis Vuitton in September planted clues on Instagram to create some buzz for Paris Fashion Week. But other high-end brands continue to shy away from social, including Apple, Rolex and even culture/design publisher Monocle. "We put out 40,000 words every month in the magazine," said Andrew Tuck, editor at Monocle, which doesn't push any of its Web articles via social sites. "And you only have to turn on the radio to hear all of our editors' voices and get their opinions." Tuck explained that his marketing team is unwilling to allow tweets to water down what the print magazine means in the hands of its readers or let Instagram photos lessen the VIP nature of Monocle's parties and events. "[Social media] feels like a little too much exposure," he said. "For our brand, it seems just a little bit uncomfortable." Rolex started a Facebook page a year ago but only posts a few times a month, while leaving its Twitter and Instagram protected so as to vet all those who seek to enter. Yet Rolex appears to be open-minded about a future policy change. 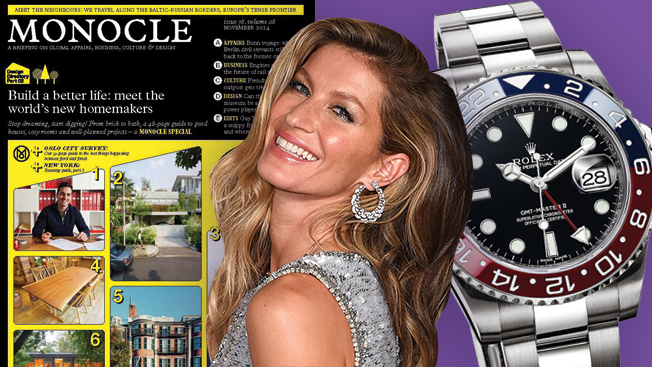 "They are not oblivious to the data," said Sarah Kotlova, client services director at Digitaria, which handles digital for Rolex. "And they are right to not just rush into channels because the brand is so admired. You cannot start a Twitter stream and then stop it." Apple declined comment. But the Cupertino, Calif.-based tech giant poached execs from social-minded Burberry and Nike in recent months, suggesting changes could be in the works. Rival Samsung is all over social, and this year hit the motherload, smashing President Obama's retweet record with Ellen's Oscar selfie. "These [anti-social] companies are resisting something inevitable," said Will McInnes, CMO of Brandwatch. Another sign of the times, says McInnes: Hollywood royalty like George Clooney are killing it (and gaining mega-social cred) on Reddit's Ask Me Anything sessions. "Twenty-five years ago, movie actors wouldn't do TV—but now that's where so many of them want to be," said Rick Liebling, head of global marketing at Unmetric. "Similarly, you are going to see luxury brands accept this change in culture."